Soybean farmers from Minnehaha, Hutchinson and Moody Counties are the winners of the 2018 South Dakota Soybean Yield Contest. 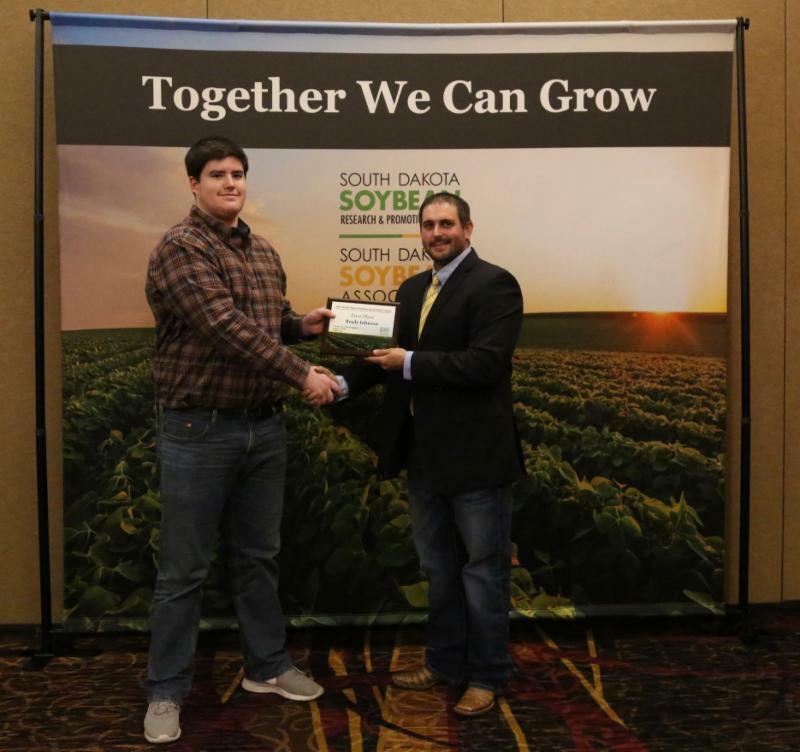 Each receiving a cash prize, the winners were recognized during the annual South Dakota Soybean Recognition Banquet on December 5 in Sioux Falls. Doug Van Duyn, Minnehaha County, placed first in the overall contest, yielding 113.94 bushels with Hefty: 19R6R2; Tim Hofer, Hutchinson County, placed first in the master class yielding 109.12 bushels with Legend: LS28X840; Brady Johnson,Moody County, placed first in the youth class non-irrigated category, yielding 78.5 bushels with Integra: 51629N and Samuel Bender, Hutchinson County, placed first in the youth class irrigated category, yielding 74.84 bushels with LG: 1870R2. Entries for the yield contest were categorized by soybean maturity and sub-divided into three categories: Irrigated, Non-irrigated and No-till. Each first place winner received a $2,000 cash prize. The second place winner in each category received a $1,500 cash prize, and the third place winner in each category received a $1,000 cash prize. Since 2017, the Yield Contest has included two additional classes; the youth class, designed to encourage the next generation of soybean growers, and the master class, focused on making South Dakota’s best soybean growers better. For a complete list of winners, visit www.sdsoybean.org/yieldcontest and click on the 2018 Yield Contest Results on the Agronomic Data page. Learn more about increasing your soybean yields by attending a Soy100 Seminar. Utilizing data and best management practices from nearly a decade of Yield Contests as well as research-based information, these agronomist-led educational seminars focus on best management practices to help farmers increase soybean yields and quality. Minnehaha County soybean farmer, Doug Van Duyn (left) placed first in the South Dakota Soybean 2018 Yield Contest, yielding 113.94 bushels with Hefty: 19R6R2. 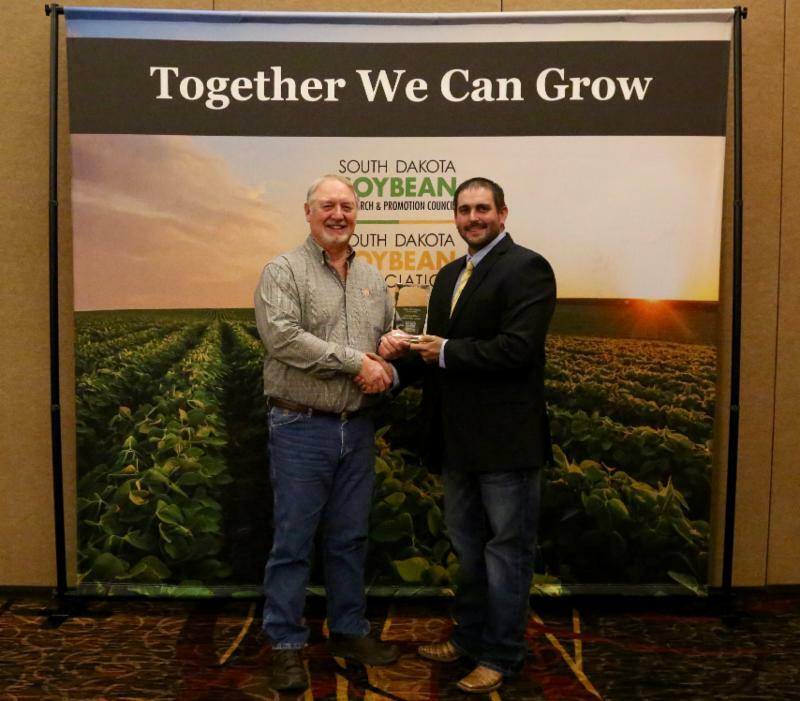 He was recognized during a December 5 awards ceremony held in conjunction with the annual South Dakota Soybean Recognition Banquet held in Sioux Falls. Sponsored by the South Dakota Soybean Research & Promotion Council (SDSRPC) and managed by the South Dakota Soybean Association (SDSA), this annual contest encourages soybean growers to push yield limits and share best management practices. For a complete list of winners, visit www.sdsoybean.org/yieldcontest and click on the 2018 Yield Contest Results on the Agronomic Data page. Van Duyn is pictured here with Jon Schaeffer, a second-generation Viborg farmer who chairs the South Dakota Soybean Yield Contest committee and serves on the South Dakota Soybean Association board. Hutchinson County soybean farmer, Tim Hofer (left) placed first in the Masters Class of the South Dakota Soybean 2018 Yield Contest, yielding 109.12 bushels with Legend: LS28X840. He was recognized during a December 5 awards ceremony held in conjunction with the annual South Dakota Soybean Recognition Banquet held in Sioux Falls. Hofer is pictured here with Jon Schaeffer, a second-generation Viborg farmer who chairs the South Dakota Soybean Yield Contest committee and serves on the South Dakota Soybean Association board. Hutchinson County soybean farmer, Samuel Bender (left), placed first in the Youth Class, Irrigated category of the South Dakota Soybean 2018 Yield Contest, yielding 74.84 bushels with LG: 1870R2. 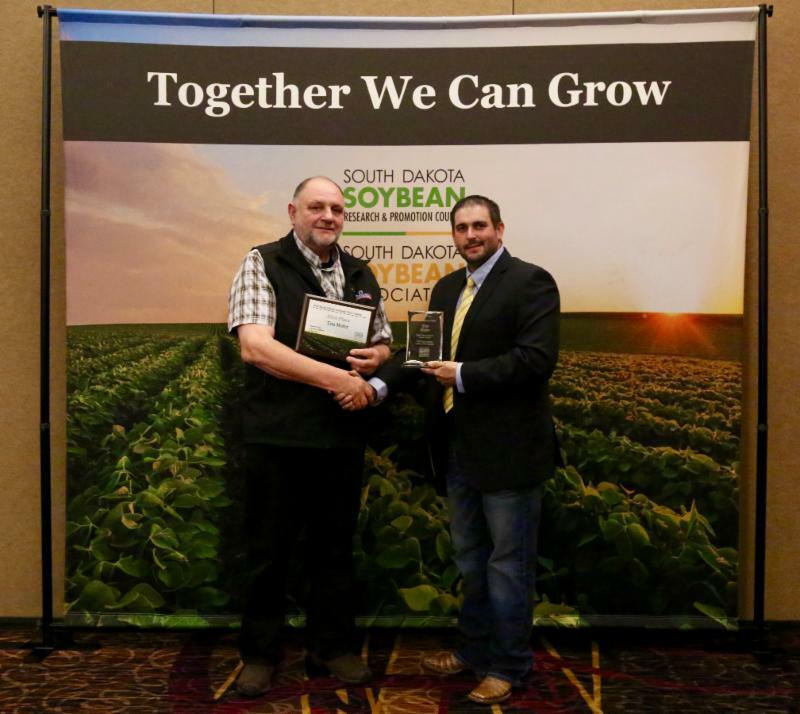 He was recognized during a December 5 awards ceremony held in conjunction with the annual South Dakota Soybean Recognition Banquet held in Sioux Falls. Bender is pictured here with Jon Schaeffer, a second-generation Viborg farmer who chairs the South Dakota Soybean Yield Contest committee and serves on the South Dakota Soybean Association board. Moody County soybean farmer, Brady Johnson (left), placed first in the Youth Class, Non-irrigatedcategory of the South Dakota Soybean 2018 Yield Contest, yielding 75.8 bushels with Integra: 51629N. 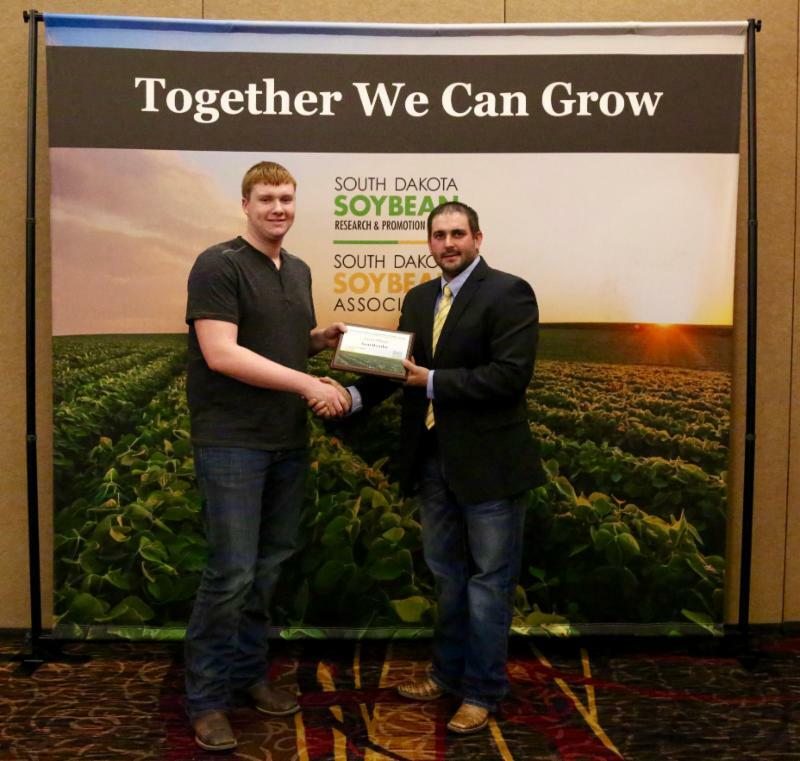 He was recognized during a December 5 awards ceremony held in conjunction with the annual South Dakota Soybean Recognition Banquet held in Sioux Falls. Johnson is pictured here with Jon Schaeffer, a second-generation Viborg farmer who chairs the South Dakota Soybean Yield Contest committee and serves on the South Dakota Soybean Association board.